On 21st May 1927, Charles Lindbergh flew from Long Island, New York (USA) to Le Bourget, Paris (FRA) in his aeroplane 'Spirit of St. Louis'. Lindbergh was at the time a US Air Mail pilot but this epic non-stop solo flight shot him to fame and was to be the start of a long and highly distinguised career promoting aviation. 99 years after the first crossing of the Alps in an aeroplane by Geo Chávez flying a Blériot XI, on 14th April 2009 Eric Raymond completed the same journey in the solar-powered Sunseeker II, thereby becoming the first solar-powered aeroplane to make the journey. FAI IPC, the International Parachuting Commission, has announced the creation of the VFS Web Challenge. This competition in Vertical Formation Skydiving enables competitors to train and perform in their own time before submitting video evidence of their jump to the competition judging panel. The entry period is from 1st May to 31st July 2009 with prizes for the top three entrants. Read more about the competition here. The 2009 Plenary meeting of the FAI Amateur Built and Experimental Aircraft Commission was held on 6th April at the Graf Zeppelin Museum in Friedrichshafen, Germany. The subjects under discussion included: electrically and solar powered aeroplanes, preparations for the World Air Games in Turin, Italy starting on 6th June and CIACA awards for 2009. Pierluigi DURANTI (ITA) was returned as CIACA President for 2009/10. Rolex, the world's leading exclusive watch manufacturer, has announced that it has become the main sponsor of the Fédération Aéronautique Internationale (FAI), the world air sports federation. Founded in 1905, the FAI is the international governing body for all forms of sporting aviation, including ballooning, gliding, aerobatics and model aircraft flying. 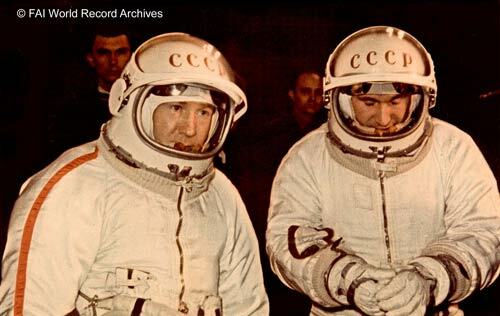 On 18th March 1965, Russian cosmonaut Alexei LEONOV (RUS) stepped out of the spacecraft Voskhod-2 to become the first person to walk in space. He spent a total of 12 minutes and 9 seconds outside of the vehicle attached by a tether, thereby gaining an FAI World Record for extravehicular (EV) duration in space. Pilot Pavel BELYAYEV (RUS) and co-pilot Leonov launched at 07:00 GMT on 18th March 1965 from Baikonur cosmodrome in the former USSR. At 08:28:13 GMT Alexei Leonov initiated his spacewalk by decompressing the spacecraft airlock; at 08:34:51 he stepped out of the vehicle, returning at 08:47:00. Telemetering data shows that his heart rate rose to 143 beats/min and breathing rate to 31 breaths/min as he first left the inside of the spacecraft. During the EV activity, Leonov was attached to the spacecraft by a tether measuring 5.35m in length. Cinematographic evidence was used in the post-flight analysis to show that, at times, the tether was taught, thereby recording the maximum distance the cosmonaut floated from the vehicle. The flight lasted for 26 hours and two minutes, covering some 717,262km and reaching an altitude of 497.7km. The spacecraft returned safely to Earth, landing near Perm at 09:02 GMT on 19th March. In a post flight report, Leonov stated "Leaving the spacecraft in outer space is quite possible and is no longer mysterious to man". This information and the images reproduced here are sourced from the official dossier submitted to FAI for world record homologation. FAI's International Rotorcraft Commission (CIG) held its annual plenary meeting on 26-27 February in Lausanne. Delegates convened in the Olympic Museum to discuss several issues, including; bids for future World Championships, details regarding competitors' participation in the World Air Games later this year in Turin (ITA) and the future direction of the Commission. IGC, FAI's Gliding Commission, is conducting a worldwide survey of glider pilots. The survey aims to better understand the issues faced by glider pilots in different countries, assess the quality of experience enjoyed by members of the sport and map out the nature of the global soaring community. IGC would like to hear about your experiences as a glider pilot and your views on soaring. Your responses will help in defining development strategies for the sport of Gliding. The International Parachuting Commission (IPC) meeting took place on 27th January to 1st February 2009 in Västeras (SWE). The Red Bull Air Race World Championship has announced its 2009 schedule, following on from a highly successful series in 2008. December 21 marks the 40th anniversary of Apollo 8 and its successful mission to orbit the moon. This flight paved the way for the first human landing on the moon by the astronauts of Apollo 11, on July 21 1969. It is time to thank all of our FAI members, media representatives and readers of these newsletters who have helped us during the year to spread the FAI News and disseminate information about our events and activities in 2008. We wish you health and happiness as this year comes to an end and we send you our Season's greetings as we look forward to another busy year in the world of air sports in 2009.